Terrence Malick is one of the most reclusive and publicity shy directors working in cinema and has made only a handful of films in a career that began with Badlands in 1973. His latest work - The Tree of Life - won the Palme D’Or at the recent Cannes Film Festival but Malick declined to accept the award in person – instead leaving the job to two of the film’s producers. 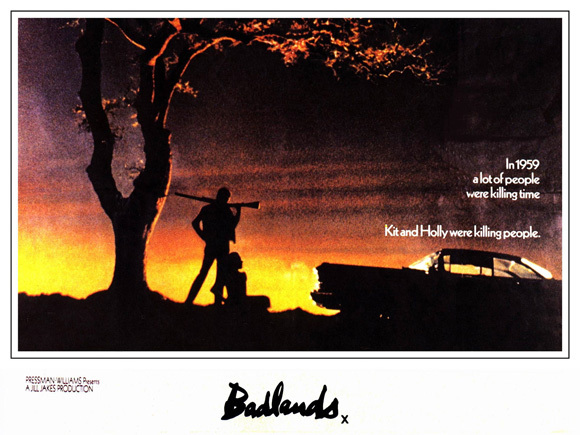 Badlands is an extraordinary movie – beautiful, poetic and dreamlike. It is loosely based on the true life 1958 exploits of Charles Starkweather and Caril Fugate and tells the story of Kit and Holly, two teenage lovers who go on the run after Kit kills Holly’s father during an argument. Their journey together across the Montana landscape is narrated by the childlike Holly in a voiceover full of romantic clichés, bizarre observations and unintentional humour. Kit, played by Martin Sheen, models himself on James Dean and dispenses his odd philosophies about life along with random acts of violence. The film’s score was the first to include Carl Orff’s haunting Gassenhauer. The piece has subsequently been used by many other movies and commercials but never to such great effect. Badlands drew universally positive reviews and announced the arrival of a major talent. In 1978 Malick went on to direct Days of Heaven, a lyrical period love story and then 20 years later The Thin Red Line – one of the most striking and unusual war movies ever made. His films continue to be highly personal and idiosyncratic but none have eclipsed the qualities of this remarkable debut feature.